Gourmet Burger Kitchen's latest campaign to promote a new Indian-themed burger has given the industry and Twittersphere some pretty bad indigestion. Is GBK's tongue-in-cheek 'curry wars' campaign culturally insensitive? The #CurryWars campaign, by You Agency, promotes the chain’s new Ruby Murray burger. 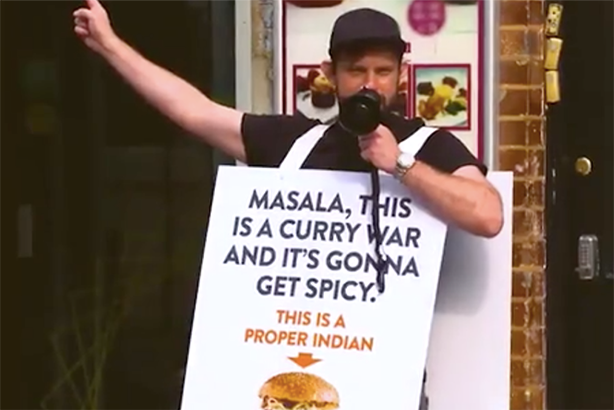 The video (below) features a man dressed in a sign, which notes the name of Brick Lane restaurants and messages including 'this is a curry war and it's going to get spicy' and GBK’s burger is ‘proper Indian’. The man stands out the front of the named restaurants and tries to convince bystanders that GBK's burger is the Mecca of masala, while curry houses aren’t 'proper Indian'. However, nobody in the apparently tongue-in-cheek video appears amused by the publicity stunt. One man politely points out the burger isn’t proper Indian, while a curry house boss refuses to allow the sign-clad man to use his bathroom, dishing out a few spicy words in the process. You Agency CEO Michael Carr defended the creative to PRWeek. "Our GBK campaigns have always been rooted in an unwavering belief in the quality of the burgers, and in this instance the joke is in the absurdity that a curry burger could possibly compete with genuine Indian cuisine," Carr said. "It is a humorous call for a curry war; with the ridiculously blind belief in the Ruby Murray burger sitting at the heart of the claim – nothing more and nothing less." A social media backlash has led to GBK and, eventually, You Agency, removing the videos from social media. Curry wars isn’t the first time a GBK campaign has left a foul taste in consumers’ mouths. In 2016, the burger chain had to apologise for an outdoor campaign that mocked vegetarians. 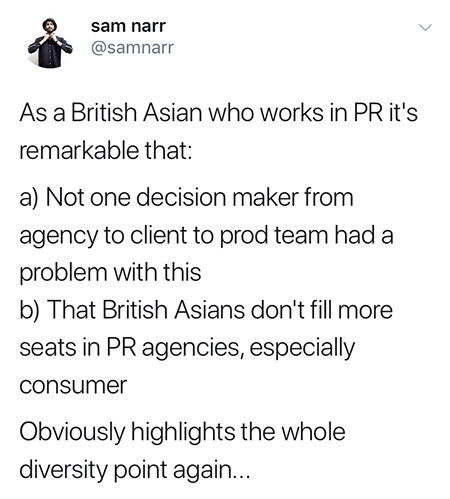 Sam Narr, founder and CEO of Kibbo Kift Agency and a creative at W Communications, tweeted that the campaign illustrated the need for greater ethnic diversity at PR firms. PRWeek approached industry creative heads to find out what they thought about curry wars. One Green Bean founder and executive creative director Kat Thomas said a stunt like curry wars might have got more traction years ago and is culturally dated. "In 2012 I launched a Coat of Arms burger for Grill’d in Australia, made of kangaroo and emu, featured in the country’s national emblem. Whilst it got mass media attention and won awards I probably wouldn’t do it in 2018," she said. "You have to appreciate the current tone and sentiment around sensitive issues. To me this feels a bit try-hard and also culturally quite dated." Fever PR managing director Bruce McLachlan said that while conceptually, the work is supposed to be self-deprecating, "the execution is so leaden that it’s deeply uncomfortable to watch". He added: "Given the current febrile atmosphere in the country, did no one at GBK or their agencies think that an aggressive faux-cockney hanging around independent curry houses warning off prospective customers wasn’t such a good look for the brand? This isn’t about being hyper-politically sensitive, it’s basic common sense." Shirin Majid, executive creative director at Cake UK, said she believes the agency and brand "had no racist intentions" and that GBK "responded in the best way, which is swiftly, directly and honestly". However, the campaign demonstrates "the need for continued understanding of how to recognise inherent racism or discrimination in our work – and the need for diversity in our industry to help us recognise it", Majid said. "I always admire when a brand takes a disruptive approach. But I also admire killing work that doesn’t work. And this doesn’t work. "First, if you’re not Indian, don’t mock Indian people. Second, the brand didn’t have a right to its claim – there’s nothing authentic about the burger being Indian. And third, a big brand going to war with small businesses who likely struggle to make money isn’t cool." 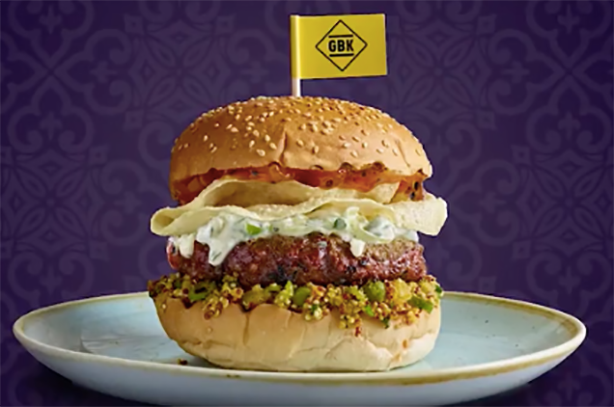 The Agency Partnership CEO and creative lead Blair Metcalfe told PRWeek that while the kitchen at GBK is clearly "cooking up a storm" with what looks like "a bloody brilliant burger", the comms team has "brewed an altogether unwanted one". "The campaign does itself no favours and makes some pretty basic missteps; playing on negative stereotypes and challenging beloved small businesses," Metcalfe pointed out. "In a less deferential, reactively charged social environment – the skill of a team can’t just be measured by when it gets things right, but how deftly it manages when it gets things wrong. Creativity is about taking risks and that can mean screwing up – big time." Metcalfe said GBK’s quick reaction and apology meant that it is at least hearing its audience, but a better approach would be to "audience-test your sense of humour before broadcasting it to the world".